Nothing is ever perfect when it comes to electric cars. Be it range limits, exterior aesthetics, sales price, or quick charging capabilities, an electric vehicle with the total package just does not exist. But a drawback here and there was not going to stop me from owning a Ford Focus Electric. That is when I discovered that my options were very limited up here in the Pacific Northwest. I could basically get a Leaf, a Model S or an i3 by walking onto their respective lots. Everything else was either impossible to get or would take some creativity. It did not seem practical to fly down to California and haul back my new EV on a flatbed. I was also unsure if I would miss out on some of the EV-based incentives by buying out-of-state. Then in November 2014, I began seeing used Ford Focus Electrics (FFE) at some Seattle-area dealerships. There were many reasons for not wanting a used EV, not least of which was eligibility for the tax incentives. So I inquired about when the ‘15s would be available. I was again stunted by the explanation that Ford was only producing the car for no-emissions compliant states, but that I could place an order for one if I was willing to wait. After test driving a used ‘13 model in February 2015, I decided to place an order for Ford to build me a 2015 model. My tuxedo black 2015 FFE arrived 14 weeks later on Memorial Day and the purchase was made. Two weeks later, I’ve driven my 500th gas-free mile and I’m still blown away. Never before have I driven a car with such smooth acceleration, rapid deceleration (due to regeneration and excellent brakes), and nimble handling which I haven’t experienced since my old Honda Civic Si in college. The ninja-like stealth electric motor has 143 HP and can go 0-60 in eight seconds, which is longer than most rodeo bull riders can stay upright, but it gets the job done. The 23-kWh battery is rated to produce 76 miles of range, but based on my initial driving habits; I’ve been getting full charge ranges in the mid-90s. I expect this is due to limited freeway travel to this point. 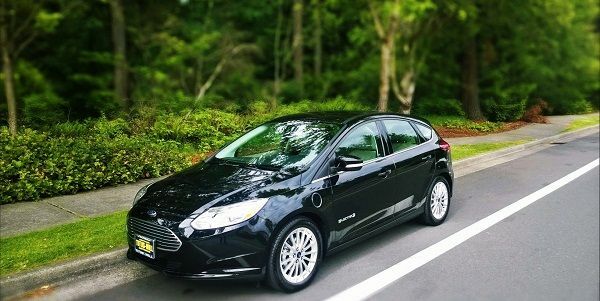 Since Ford has done little to sell its Focus Electric beyond compliance car states, I know that I am rolling in rarity for the time being amongst the Leafs and Prius on the road. And while it looks very much like a typical ICE hatchback, I still get the curious stares and double takes from other drivers. The voice-activated SYNC system works great as does the mobile app that allows you to monitor charging, trip plan and precondition the cabin from afar. With heated leather seats, sharp interior design, multi-color ambient lighting and a phenomenal stereo I find the FFE to be all luxury at a respectable price. The two drawbacks with the FFE are the absence of both a quick charge port and cargo space. The main battery pack is under the lift gate, reducing hatch cargo space by 39 percent, to just 14.5 cubic feet. I recently went to Lowe’s for some yard supplies and used my creativity to get home a shovel, a hanging flower pot and three bags of soil. The electric motor encompasses all the room under the hood. I admit, it would be so nice to be able to charge in 20 minutes, but it is not a requirement for my daily driving needs. Maybe it is for yours. The car comes with a charging cable for 110v plugs, but a 240v is definitely recommended. Since I drive on average 26 miles per day, I usually charge every few evenings. Plug it in and walk away. Overall, the FFE has been the best car experience I’ve ever had. Heck, it may be the best thing I’ve ever owned. The car is roomy, stylish, inexpensive to operate, addictingly fun to drive… all in all I can’t imagine a better car to own and use as a daily driver. While I foresee keeping at least one ICE vehicle in the future, I can very easily see 95% of our family driving coming from pure EV vehicles. Five hundred miles in, the FFE gets an A from this owner – as close to perfection as I could get. Congratulations. It my choice for my next car. I had a 14, and put 9k on it in 8 months. Loved it, and only sold it to get ready for a Model S. It's a fantastic little car and wonderful for any past volt owner like myself who found themselves wanting just a little extra range. Though winter range with the heat on could dip as low as 45 miles, I never had to take it farther then that in a one way trip. We are a family of 5 also. It fit 2 adults, 2 csr seats and 1 infant Seat while being the only electric (that's under 70k) that did it while also holding our double wide stroller and baby affects. Reading your experience it is very reflective of ours. We purchased an i3 about 3 months ago and can't ever see us going back to an ICE. As you say smooth quiet roomy and inexpensive. The "PECUNIARY PENALTIES OF PETROL" are actually something most people accept unquestioningly, let alone the queuing to fill-up and then queuing to pay - and that's even before considering the environmental costs. I have a colleague who recently tallied up his petrol costs over 7 years of ownership/travel his Toyota Corolla - He actually spent more on fuel than the car???? AND it put nearly 30 tonnes of CO2 into the atmosphere. And some say EVs are expensive. Congratulations on buying an American-made EV. I bought a '14 FFE last July, have over 10K gas-free miles on it, and have a current avg. of over 92 miles per charge. At our current electric rates ($0.13/kwh), I'm averaging about $3 of electricity to drive 92 miles. Good luck beating that in a Prius, a Volt, or anything else that isn't at least $70k. Plus, solar panels ensure the energy is made from renewable sources, so any arguments about burning more coal to drive an electric car are moot. After the tax credit, my net cost for the car was under $21K, and financed for 0% for 60 months. Again, good luck finding a better car to get you from A to B at that price. As for the range, we have driven it from Richmond to Norfolk nonstop, and took it with us camping over Memorial Day weekend, where we were able to charge up the car at the state park we stayed at, right at our campsite! The best part is the lack of maintenance. I just had the tires rotated at 10k miles for about $30, and next year I'll get the cabin air filter replaced for an additional $20, so figure about $40/yr. Tires are and windshield wipers are about the only other things I need to worry about. And the 0-60 times aren't very important for city driving anyway. The 0-20 or 0-30 time is better than most cars with a much faster 0-60 time, so it's easy to change lanes from a light by sprinting ahead of the other stopped cars and changing lanes once safely ahead. Last piece of advice, roll your windows down and play loud music in residential driving, otherwise pedestrians WILL NOT HEAR YOU! The car is really too quiet, and I've almost had to honk my horn to let people know a car was coming up behind them. While EV is better than no EV, I think fast charge is necessary for the vehicle to be truly practical. It's not that you need fast charge every day. But there are unforeseen circumstances that you need more than the range in typical drive. With gas cars, you simply fill up. With DCFC, you simply charge up in few minutes. Without DCFC, you have to go home first to get your gas car. I suppose one can rent a car locally, but that's still distasteful hassle (at least for me). Granted, this is rare situation, but there is ever present sense of range anxiety any time EV is driven without DCFC.